The used Hyundai Elantra is a small sedan that makes an excellent pick for drivers who want a smooth, thrifty ride, modern tech gear, and spacious seating. 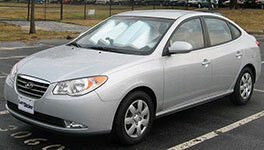 Once a great pick for economy buyers, the Elantra has quickly become one of the most attractive options in the segment. Check out our used guide to learn more about how these small sedans have changed over the years. The modern Hyundai Elantra is the pick of the litter, offering fresh, modern exterior style, cutting-edge performance, and a wealth of tech features. Many of these tech innovations increase passenger protection. The BlueLink telematics system adds a layer of safety with features like emergency assistance and stolen vehicle recovery. The forward collision warning system can even detect pedestrians and automatically apply the brakes if it senses an oncoming crash. The rearview camera comes in handy when you're backing out of snug spaces. Under the hood, the Elantra's new engine lineup is more powerful than ever - and still manages big savings at the pump. The 2.0-liter four-cylinder engine generates 147 horsepower and 132 pound-feet of torque for the line's swiftest ride yet. With the automatic transmission, the Elantra earns up to 29 city/38 highway mpg. Inside, you'll feel completely at home. 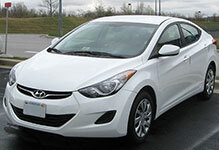 These used Hyundai Elantra models are roomy and refined. From the driver seat, important controls for the audio and navigation systems are within easy reach. Both rows of seating are big passenger space and support. 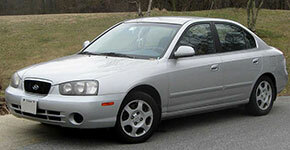 If you're shopping for a used Hyundai Elantra, the fifth generation is massively appealing. These models had more to offer in terms of passenger space and fuel economy. Inside, the stylish cabin delivered substantial head-, leg-, and elbowroom. The 2.0-liter inline-4 produced 138 horsepower and 136 pound-feet of torque for a smooth, efficient ride. You'll earn 28 city/36 highway mpg. Inside, the fourth-gen Elantra is more refined than ever before. With improved passenger ergonomics, this Elantra is a great pick for commuters. High-tech features, like an auxiliary audio jack and cruise control, help make life easier and more enjoyable. This generation is also big on safety, offering antilock disc brakes and anti-whiplash front head restraints. The redesigned, fourth-generation Hyundai Elantra sported throwback coke bottle styling and a new engine lineup. In addition to gas-powered four-cylinder options, shoppers could choose the 1.6-liter turbocharged diesel inline-4 for impressive performance. All engines offered increased fuel economy. These models also earned excellent crash-test scores. For the fourth generation, the Insurance Institute for Highway Safety gave the Elantra its top score of "Good." 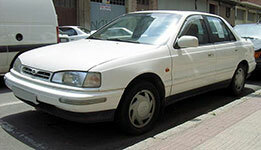 For the third generation, Hyundai offered a four-door sedan and a five-door hatchback. 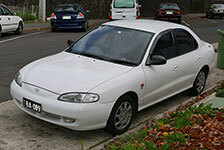 These models offered increased passenger protection, with standard front and front-side airbags. Inside, features like leather seating and a blue-lit instrument cluster offered an air of luxury. Like those that came before them, these models also derived their power from a range of inline-4 engines. Shoppers could choose between two body styles, a four-door sedan and a five-door station wagon. Inside, passengers enjoyed roomy, supportive accommodations. When the Elantra first appeared for the 1990 model year, it offered an attractive price tag and a thrifty four-cylinder engine. Shoppers could choose between a five-speed manual and four-speed automatic transmission, both of which were smooth and responsive.